Save the date for the annual Fiddling Frog Dance Festival! 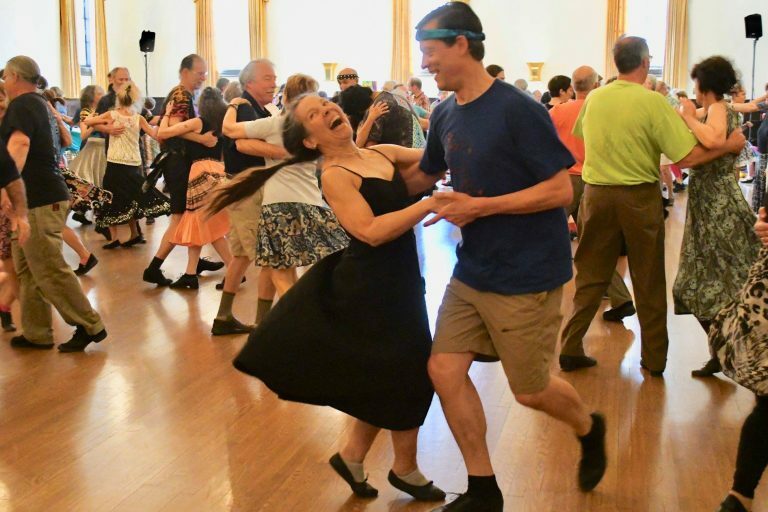 A full weekend of great contra dancing to fabulous bands and skillful callers in beautiful Pasadena, CA. Registration is open now! Eloise & Co. features the combined creative forces of two of the country’s most sought-after dance musicians, Becky Tracy and Rachel Bell. These two, this time joined by guitarist Andrew VanNorstrand, crank out dance music with unbridled energy and soaring beauty. Their depth and versatility is evident not only in their dynamic playing but also in their rich and unique repertoire, ranging from exciting original compositions to rock-solid traditional tunes. 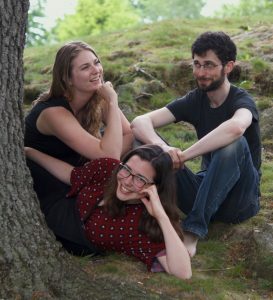 An energetic dance band from Boston, San Francisco, and Seattle, the Free Raisins fuse New England roots with a modern groove. They promise a versatile mix of supremely danceable tunes—come out and get your two scoops worth! 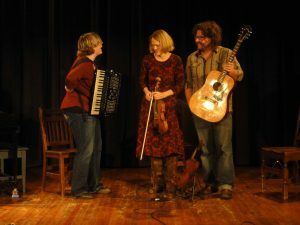 The Free Raisins are Audrey Knuth on fiddle, Jeff Kaufman on mandolin, brass, and feet, and Amy Englesberg on piano and accordion. Lisa Greenleaf has been treating dancers across the country to her high spirited, witty calling for many years, and is known for precise walk-throughs of zesty and flowing dances. 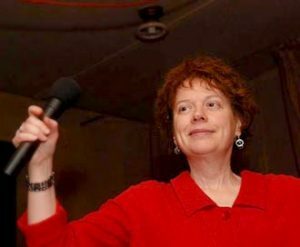 Whether she is presenting cool contras, hot squares, or focused callers’ workshops, Lisa engages the crowd with her humor and community spirit. Bob Isaacs has been a highly sought after contra caller for over 20 years. 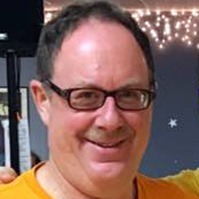 Bob, who is a skillful dance writer, has choreographed over 2000 contra dances. He writes and calls unique contra dances, squares, grid squares, and zias. 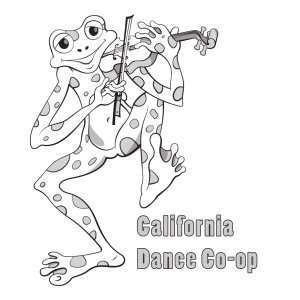 Registration for Fiddling Frog Dance Festival 2019 is open! Online registration as well as by mail is available. Registration early-bird pricing is $165 until Dec 31. Beginning January 1 it is $175. If you are under 30 you can register for $85 in exchange for a youth work scholarship. Work scholarships are available upon request on a first-come, first-serve basis. Registration is not transferable. All cancellations are subject to a $20 processing fee. If you cancel after January 14, 2019, refunds will be at the discretion of California Dance Co-op (e.g., a dancer is admitted from the waiting list). ABSOLUTELY NO REFUNDS AFTER FEBRUARY 15, 2019. Prices below include registration fee plus PayPal’s service charges (about 3%), so they are higher than if you send a check. • You can view your Shopping Cart at any time before checkout by clicking the View Cart button. • If paying for several of the SAME item, you can adjust the quantity on the Shopping Cart page. • To pay for several DIFFERENT items, click “Continue Shopping” in upper right of the Shopping Cart page to go back and enter additional items. • SCHOLARSHIP REGISTRATIONS – Please only make payments for these if you have arranged it with Frannie Marr in advance. To help others attend camp, donate to the scholarship fund. Thank you! A list of local hotels is provided below. A wide variety of healthy and hearty refreshments will be provided throughout the daytime and evening dances. There are many options for meals nearby. Want your old favorites to become someone else’s new ones? Start perusing those closets now.